Rumparooz diapers wet bag meets the demands of cloth diapering parents by changing up the design to allow for storage of more cloth diapers. Most wet bags are flat, like an envelope but the Rumparooz diaper wet bag is half moon shaped to allow more cloth diapers to be stored until you're ready to launder them. Rumparooz Diapers- A Family Favorite! Rumparooz cloth diaper brand was born of out necessity when Julie Ekstrom's second daughter showed a heightened sensitivity to disposable diapers. Drawing from her 20 years of sewing experience, Julie set down with pencil and paper in hand to design what would become the Rumparooz One Size Pocket Diaper. Necessity truly is the mother of invention! 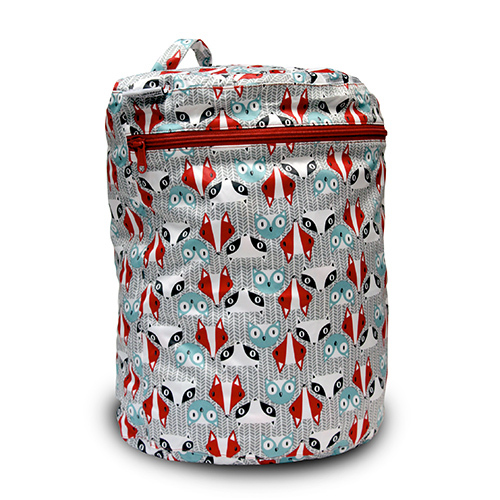 The Rumparooz cloth diaper wet bag continues the Rumparooz tradition of innovation and family friendly design. Barrier Seam Sealing - No “gluing” nor “ironing” to seal seams. Seams are physically sealed away from moisture! 3D Design - Traditional “regular” size wet bag, except instead of being flat (like an envelope), the Rumparooz wet bag is HALF MOON shaped to allow more volume. I love the shape of this wetbag and that it stands in its own as it gets full! The zipper pull is also very sturdy, that’s a huge plus for me! We have over a dozen wet bags and this one is by far a favorite. It holds more than you’d expect due to its can like design. There is also a hook so you can easily hang it on your changing table or on the go. it's so soft and large. I put it in bathroom for soiled diapers after i spray them . I have this bag in 2 different prints and they work great. 2 days worth of my Grovia diapers fit great in here.